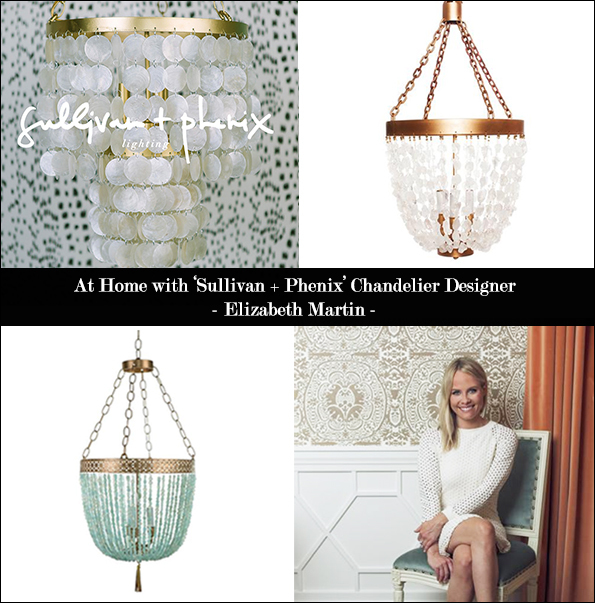 I absolutely love beaded chandeliers so I was pleased to come across brand Sullivan + Phenix, a chandelier company with a gorgeous array of beaded chandeliers designed by NYC designer Elizabeth Martin. 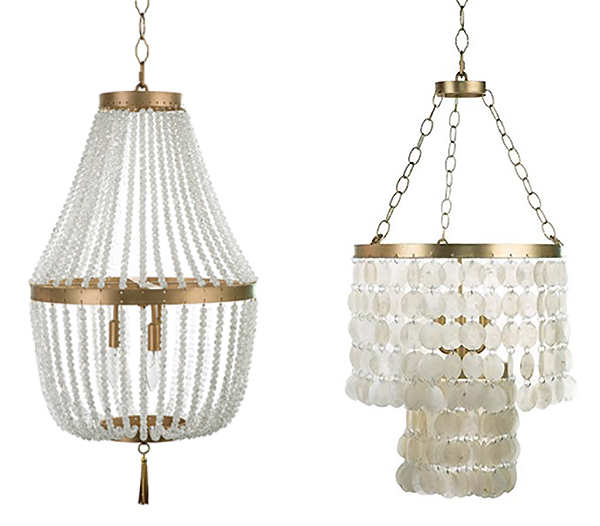 Elizabeth creates chandeliers with both gold and silver bases in a range of beautiful, beaded shades. 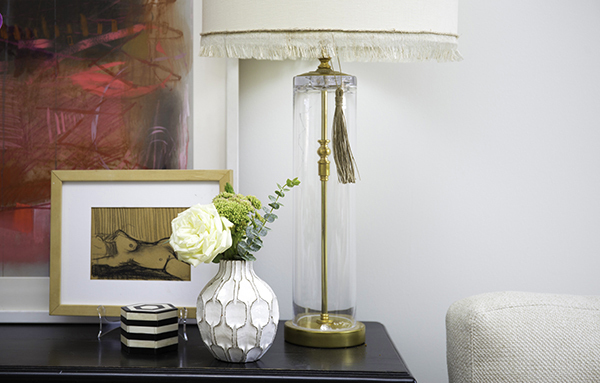 Today Elizabeth gives us a tour of her NYC residence showcasing her artistic design style and love of chic decor. Jacquin: How did your passion for lighting and lighting design begin? Elizabeth: I was born and raised in the South, however, my lighting design idea slowly began to transform into a reality when I decided to move to New York City a few years ago at the age of 29. Overall, I was indecisive about what direction I wanted to go career wise. The most exciting part of it all for me was that the world was my oyster. In New York, everything is about who you know when it comes to getting a job. Somehow, with the help of some friends, I landed interviews with a few of the top companies in New York City. As much as I tried to get excited about a position in the ritzy Upper East Side of Manhattan, at the end of the day it wasn’t my passion. Still searching for the niche that fit me best, I decided to take a job in Soho at a fabulous high-end home store there. I fell in love with all of the beautiful chandeliers that we had hanging in the store. I started to brainstorm and realized that handmade chandeliers were somewhat of an untapped market. I have always wanted to work for myself, so it was there that my idea was born and I became determined to make my dream a reality. 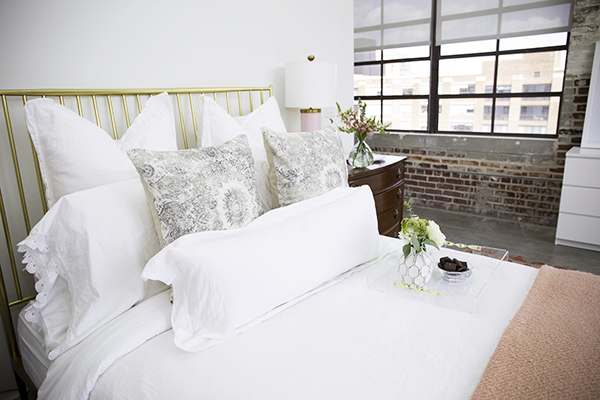 Jacquin: Tell us about how you launched your lighting brand, Sullivan + Phenix. How was your time living in NYC instrumental in developing your brand? Elizabeth: I started making chandeliers in my Soho apartment in New York on Sullivan St, which is where the first part of the name comes from. “If you can make it in New York you can make it anywhere” is amotto you hear often about the busting, fast paced city. There is so much inspiration all around you in the city all the time, it’s hard not to be motivated to be creative and do your own thing. Most everyone with a brain that is creative would tell you that we think out of the box and operate differently than most people. Moving back home to Georgia after my time there was mostly to continue to pursue and grow my business. When I first moved back, I was making my chandeliers out of an old mill that had been renovated called the Eagle & Phenix. So the name Sullivan + Phenix is a combination of the start of my company in New York, and then the continuation of it when I relocated. Being fortunate enough to work for myself and not for someone else was like a weight being lifted off of my shoulders. I am constantly coming up with ideas and dreaming of new designs for my chandeliers. I definitely have found my passion, and I think a creative outlet in life is one of the best things you can have in my opinion. 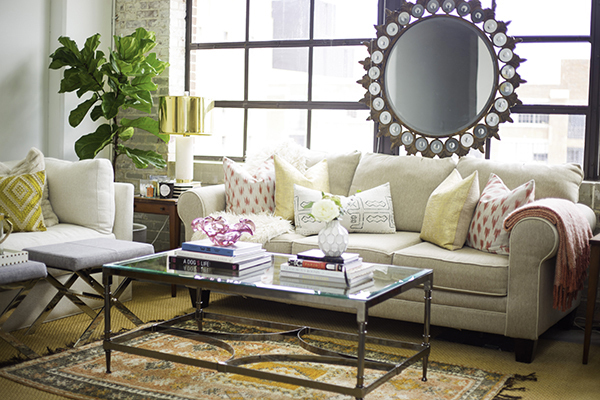 Elizabeth: I am definitely inspired by all interior designers who aren’t afraid to take risks. My favorite thing is when I go into someone’s home are those “wow” pieces that almost make you gasp at how fabulous they are. This could be anything from a unique piece of art, to a pop of color in an unexpected place. 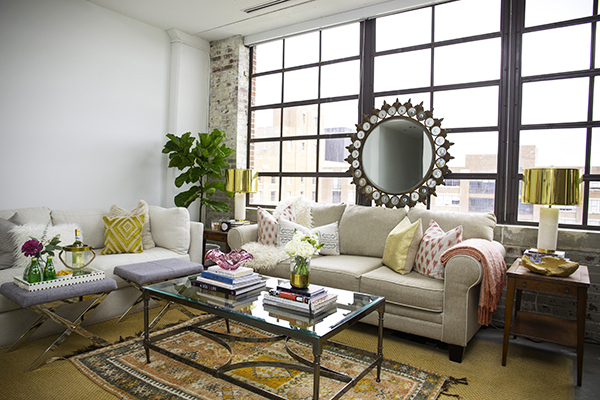 I also love mixing different textures in a room. That said, I would have to say that Kelly Wearstler is definitely one of my greatest creative influences. Another would be my sister, Lulie Wallace! She is an artist based out of Charleston, SC. I cannot say enough about how much I admire her, and her work, and how far she has come in her career. She is definitely an inspiration to me, and I can only hope that one day I will flourish as much as she has over the years. Jacquin: What steps did you take to educate yourself on chandeliers and lighting? What did you most enjoy about the learning phase of chandelier design? Elizabeth: I learned a lot about lighting from my metal fabricator that I used to make some of my very first chandeliers. He was located outside of the NYC, so I used to rent a car, and drive out to Bridgehampton, NY where his metal shop was. He had years of experience as a welder, working on custom jobs for his high-end client homes in the Hamptons. There are many intricate stages that each chandelier goes through before being complete. After the welding process, the chains are then attached to the preferred length of the client, and piece is painted by hand. Next, the beads are carefully counted and strung one by one. I would say that although the beading part is tedious, it is my favorite part because that is what makes the chandelier so pretty! Chandelier designer Elizabeth Martin at work crafting a Sullivan + Phenix chandelier. 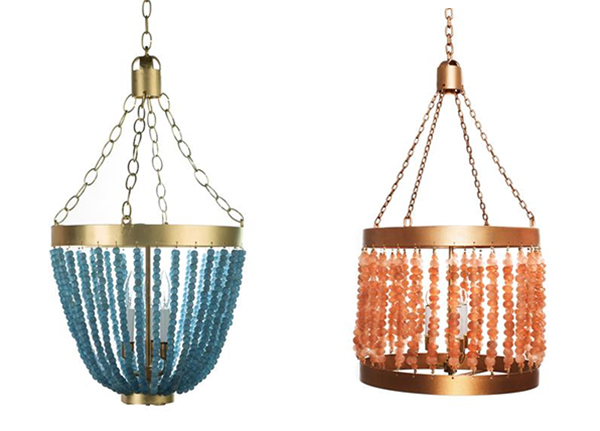 Jacquin: What is your all time favorite chandelier design so far? Elizabeth: My favorite chandelier design actually is the very first one that was made, the “Riley” chandelier (see below). 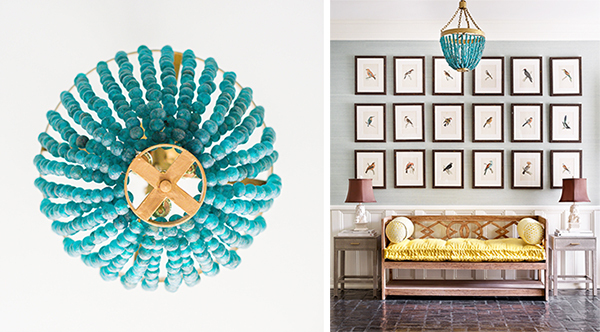 This chandelier is so special to me because of the beads. They are imported from Ghana, Africa and are handmade by women of the Krobo Tribe using recycled glass. The powder color comes from finely ground glass most commonly made out broken bottles and other scrap glasses. These beautiful glass beads are made in vertical molds. Each mold is filled with finely ground glass, which is layered to create different colorful designs. The beads are fired in clay kilns until the reycled glass fuses. They are even more beautiful in person, and the way that the light hits them when the chandelier is lit is absolutely amazing! Chandelier shown- Elizabeth’s favorite design yet, the “Riley” Chandelier. Jacquin: You have a lot of great decorative features in your apartment! 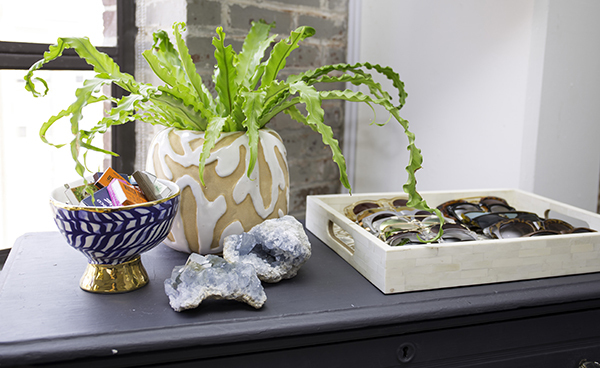 Tell us about your favorite space in your home. 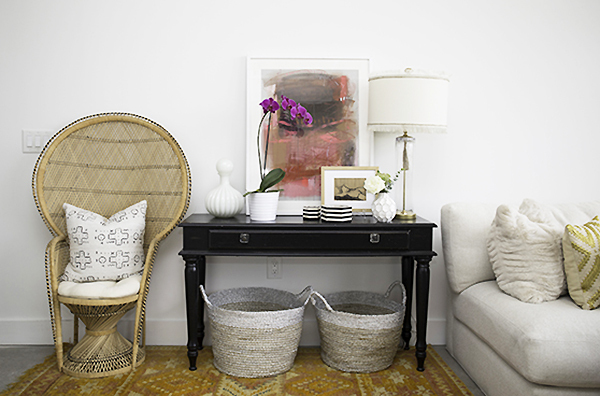 Elizabeth: My favorite space in my home is right when you enter into my apartment through the foyer. There is a peacock chair that I love along with an abstract art piece by one of my favorite artists, Teil Duncan (see above). There is a fun story that goes along with the chair, which originated in East Asia and was reserved for royals because of it’s throne like frame. In the 19th century, the designs made their way to the United States, where they were popular garden-party perches. In the 60’s and 70’s the chairs were popular for boho-glam photo shoots from everyone to Stevie Nicks, to Cher, to Bridgette Bardot. 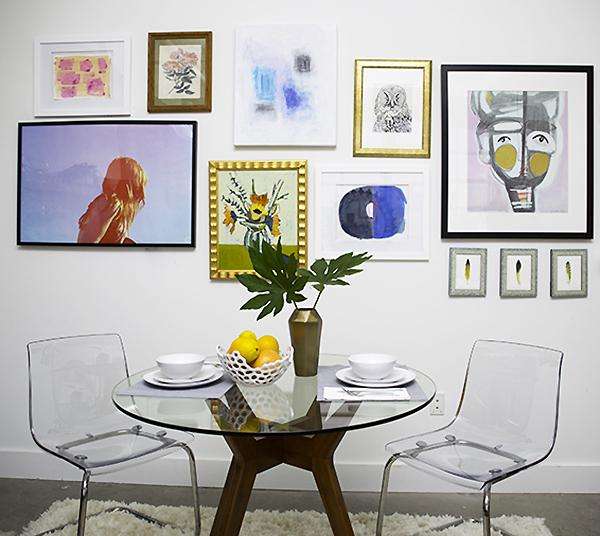 It’s always interesting for me to have background information about pieces in my home! Jacquin: What has been your most exciting moment as a lighting designer and entrepreneur so far? Elizabeth: All moments are exciting for me as a lighting designer! Every time I get a new order it’s like Christmas for me! I work hard to make sure every precise detail is fulfilled according to the custom dimension and bead request from my clients. It is fun to make them unique for each person, because everyone has different needs when designing their space. Most importantly, I look forward to the future of my business, and the fabulous opportunity that I have to continue to evolve to make new and different designs! A round sphere shaped piece is in the works at the moment, so please stay tuned!